The descriptive element of this section and the parts on function and status and trade and exchange have been taken from reports produced for the project by Ruth Leary. Gwladys Monteil provided the descriptions of samian ware. The Roman presence in Bingham has long been known. In the early 18th century William Stukeley (1726) gave a description of the visible stone ruins of the Roman small town Margidunum, which is in the north of the parish and spread over the junction of four parishes. The western boundary of the parish is the Fosse Way, a Roman road. Margidunum was excavated by Oswald (1948) between 1910 and 1936 and later by Malcolm Todd in 1966-1968 prior to the destruction of much of the town centre by road works. According to Todd (1969) Roman occupation of the Margidunum site began between AD 50-55 and continued until the end of the Roman period. He claims that it was occupied by the military only until AD 73. The defensive ramparts and walls around the town centre were constructed and reconstructed in at least two phases, the first in the second century. The town, however, was known by both Oswald and Todd to extend well beyond the limits of the central defences. Leary and Baker (2004) provide a synthesis of the information available about Margidunum, including that from field walking along the A46 carried out by Trent & Peak Archaeology, which provided evidence that the town extended for several hundred metres along the Fosse Way both north and south of the town centre (Knight and Kinsley, 1992) and along the A6097 towards Gunthorpe. Excavations carried out in 2009 by Wessex/Cotswold Archaeology prior to the building of a new A46 will provide information on these outer parts of the town when the findings are published. Indications of Roman activity elsewhere in the parish have been yielded in several other places. During the construction of Carnarvon Primary School in the late 1960s evidence of a probable Romano-British homestead was uncovered (Gregory, 1969), while further building work there in 2003 (Sumpter, in prep) revealed a Roman well and a large amount of pottery. More was revealed while building an extension in 2008, but this has not yet been reported. These two sites, Margidunum and at Carnarvon School, are the two most substantial in the parish, but a pre-build survey carried out in 2004 of the site on the old bowling green behind the Chesterfield Arms in Bingham found evidence of a Roman field system, industrial activity and a cemetery (Rayner, 2006), suggesting that there might be something more substantial within the present-day built-up part of Bingham. A sestertius of Hadrian dated c119-121 AD was found nearby at the junction of Cherry Street and Church Street while laying gas mains (Nottinghamshire Sites and Monuments Record No. 05599). Field walking in the parish in 1978/79, reported by S.R. Coleman (1979) showed that Roman pottery sherds were to be found in a number of fields. Crop marks indicative of a double-ditched enclosure near the River Smite on Starnhill Farm, were associated with a small number of sherds of Roman pottery found in the field by him. Prior to the current field-walking project, then, it was evident that during the Roman period there was of an active small town at the edge of the parish with a hinterland that contained evidence of fairly widespread Romano-British occupation. The ceramics have been catalogued in ware groups according to the guidelines laid down by the Study Group for Romano-British pottery (Darling 2004). Both sherd weight and count have been recorded to facilitate assessment of the condition of the ceramic assemblage using average weights and the vessel types were quantified using estimated vessel equivalents (EVES). This method measures the percentage of the rim surviving so 13% of a rim is equivalent to 0.13 of a vessel and one vessel is represented, while 213% is equivalent to three vessels. This is standard methodology in the study of Romano-British pottery. Apart from the sherds from fields 0004, 0007, 2295 and 9805 (Figure 1.1), which had very high averages from a very small number of pieces, the average sherd weight of less than 10g is normal for a field walked collection and indicate that the material has been fragmented and eroded by ploughing and burial conditions. There was little collected that suggested large amounts of fresh material was being incorporated in the subsoil. Only in field 9912 were some fresh sherds found including adjoining sherds freshly broken. These were found in the south-west corner of the field adjacent to the Fosse Way and also in the north-eastern part near Chapel Lane. Two pairs were found some 5-6m apart – to the south a pair of sherds from a Mancetter-Hartshill mortarium (made near Coventry) and to the north-east, a pair of sherds from a samian bowl form 38. Two sherds from a third century black burnished ware (BB1) jar were found near each other to the west of the samian bowl. As this field has not been ploughed in recent time this must be due to some other form of disturbance. The material from field 9912 had a slightly lower average sherd weight than that from the adjacent field 9809 (12g.) but higher than fields 0111 (7g.) and 0412 (4g). Some biases in collection procedure may have affected the ceramic assemblage, particularly in fields done in the first season, when many of the volunteers were new. The larger than usual proportion of the assemblage made up of fine wares suggests that these paler sherds were easier to spot in the ground than the grey wares. This has the affect of distorting the group in favour of tableware during all periods and this should be borne in mind when studying both the function/status and the trade aspects of the group. The field walked data are being used to try to provide information about the development of Margidunum outside the defended town centre and to improve understanding on the rural occupation of the hinterland to Margidunum during the Roman period. Figure 3.14 shows the distribution of Roman pottery sherds throughout the parish. They were found in 64 of the 97 fields surveyed and form low-density scatters in most of them with a large concentration around Margidunum and small clusters in several fields remote from the town. These concentrations are shown and numbered in Figure 3.14. They have been identified by visual examination of the maps, not statistically. Figure 3.14. Distribution of Roman pottery of all ages. The areas outlined in blue are clusters that are thought to be indicative of settlement. The numbers with them refer to the text. The art of soil improvement was known to the Iron Age British. Jones (2004) states that Pliny observed that the British improved their soil by marling, while Sheil (1991) quotes Cato, Varro and Columella among the ancients whose treatises on soil improvement provided the basis for understanding in the middle ages. The low-density scatters of Roman sherds, therefore, could be the result of spreading manure on arable fields, though it is not widely accepted that this was practised in Roman times ( See Chadwick, 1997, for a discussion in this). The areas free of Roman sherds could be either managed woodland or pasture. It may be significant here that around Dunston’s Clump in northern Nottinghamshire, Garton (2008) found practically no pottery sherds in the brickwork-plan fields. All the Roman pottery she collected was in small clusters that she claimed were indicative of household middens. The fact that there is a low-density scatter between clusters in Bingham might, therefore, suggest a different land use here: arable agriculture in Bingham, stock rearing in Dunson’s Clump. In the hinterland to Margidunum three of the small clusters are associated with crop marks that may be indicative of Romano-British homesteads. All three have both Iron Age and Roman pottery sherds associated with them. The other small clusters are not easy to determine. Crop marks are not usually found over clay lands and while most of the southern part of the parish is underlain by skerry (thin beds of a calcareous sandstone) producing sandy soil, which might be susceptible to forming crop marks, the skerries are thin and unevenly distributed over clay and crop marks may not show everywhere. According to Jones (2004) in the study of Whittlewood in Northamptonshire and Buckinghamshire, clusters of Romano-British pottery indicative of small settlements or farms were spaced on average about 800 metres apart, while, more recently Garton (2008) in a study of the brickwork-plan field systems on the Sherwood Sandstone centred on Dunston’s Clump in northern Nottinghamshire, has found clusters of Romano-British pottery in association with small enclosures spaced between 375 and 1200 metres apart. Some have no other indications that they may be habitation sites, but her conclusion is that the clusters represent middens and rubbish dumps near habitations that were left in situ and never carted into the fields as manure. In Bingham the spacing between the clusters is between 450 and 1500 metres, which makes it realistic to propose that they also may indicate the presence of small farms. Fields 9809, 9608, 9912, 0111, 0414, 0412, 0409, (see Figure 1.1) the northern part of 0507 and 0710 form a block to the south of the Margidunum roundabout, the site of the central defended part of the town. The finds density is greatest in the northern part of field 9912 close to the Margidunum roundabout and the Roman town centre, but it is high in a 50 metre-wide zone along the Fosse Way from the roundabout to within 50 metres of the south-western boundary of field 9809 with a less dense scatter over a large area outside this zone (Figure 3.15). Todd (1969) described Margidunum as a “long-straggling group of buildings, most of which lay on the Fosse Way frontage.” Knight and Kinsley (1992) and Kinsley (1993) found an extensive distribution of Roman pottery sherds and building materials during field walking on both sides of the Fosse Way for several hundred metres north and south from the roundabout. Also, ditched compounds were detected by magnetometer survey on the north western side of the Fosse Way (Appleton et al. 2003). In this project a larger area of the Bingham parish has been field walked, providing additional information about the extent of the town of Margidunum. Figure 3.15. The distribution of pottery around Margidunum, shown by age. The greatest concentration of Roman material is in the northern part of field 9912 and field 0414 (see Figure 3.15 for field numbers). This area lies immediately to the south of the central defended part of the town, no part of which is in any of the fields within Bingham parish, and extends to within about 70 metres of the south western boundary of field 9912 on the Fosse Way. 28 fragments of ceramic building material were collected from these two fields, all at the northern end nearest the roundabout. Two of the ceramic building fragments (one from field 9912, the other field 0414) are curved in a similar way to the curved roofing tiles known as imbrices and two others turned at right angles similar to the flanges of the flat roofing tiles tegulae over which the imbrices fitted. The remainder need not necessarily be of Roman date but were in a similar fabric. The nearest known buildings are Todd’s buildings A, C, P and Q (Todd, 1969). Building A had a late clay floor overlying the rampart, which had mid-fourth century sherds stratified below the floor. Building C was an earlier stone walled building with pottery suggesting a mid-second to mid-third century date. Buildings P and Q were timber buildings of first century date. Traces of further buildings with second and fourth century pottery associated with a clay floor and limestone and sandstone spread have been recorded by Knight and Kinsley (1992) at the south end of field 9912 beside the Fosse Way. The Roman pottery from both of these fields contrasts with that from other fields further away from the town centre in having imported goods such as Dressel 20 oil amphora and Gallic wine amphora as well as a relatively high proportion of samian ware (5%). One coarse white ware sherd compares well with products of the Verulamium region and may be an amphora or a flagon. Goods from this region, flagon, amphora and mortaria, were common in the late first to early second century. An incomplete rim sherd from a flanged white ware mortarium belongs to this early period and may be of local origin, from Margidunum or Lincoln, or from the larger industry at Mancetter-Hartshill, near Coventry. Other white ware sherds are likely to be from flagons or beakers and are similar to wares thought to come from the Mancetter-Hartshill kilns. Early coarse wares include the grog-tempered wares common in Margidunum in the mid-late first century and two sherds from rusticated jars and one from a burnished carinated bowl, both types used in the mid-first to early second century. Black burnished ware (BB1) from Dorset was recovered only from these two fields and the northern part of field 0111. One rim sherd, from a grooved-rim dish or bowl was identified. The vessels in this ware date to the late second to third and the third to fourth century. In this region BB1 is particularly associated with towns and military sites and at Leicester it is particularly common in the third century (Clarke 1999, table 23 and 28). One sherd compared with BB1 from the kilns at Rossington Bridge, near Doncaster. Derbyshire ware, including a cupped-rim jar, is represented by three sherds. Shell-gritted wares are more common here. Few diagnostic sherds were found but a Dales ware rim and a South Midlands hooked-rim jar, probably from Harrold, Bedfordshire, was identified. Dales ware is common at Lincoln from the mid-third century and several body sherds could be confidently identified in addition to the rim sherd. The Harrold jar is a type common in the fourth century, though present in the late third century at Leicester (Clarke 1999, 138). The undiagnostic body sherds are likely to belong to Harrold jars since this would be in keeping with the date of the other sherds from this field. However an oxidised, shell-tempered ware was also present at Margidunum in the first century (Oswald 1948 pl. V no. 14 and pl. VIII nos 1-2) and a Northamptonshire source similar to the Harrold jars, is also likely for this group. Both are likely to contain similar fossils and it may not be possible to differentiate between them where body sherds only are represented. Grey wares of unknown source, probably local, include a range of vessels: copies of BB1 jars and dishes, burnished wide-mouthed and narrow-necked jars, a bead and flange bowl with inturned rim and conical bead and flange bowls and a lid. A coarse grey ware was used to make a double lid-seated rim jar, a type common in the late fourth century at Lincoln (Darling 1977). A fine grey ware platter, a second medium grey ware platter, a neckless jar with short everted rim, an everted-rim beaker and a grey ware reeded-rim bowl belong to the Flavian-Trajanic period (late first – early second century) when the army were probably present at Margidunum. Mortaria include six sherds from lower Nene Valley reeded rim mortaria of the late third-fourth century, two sherds from Mancetter-Hartshill reeded, hammerhead rim mortaria of the mid-third and mid-fourth century and two from collared mortaria from the same potteries of late second –mid third century as well as many bodysherds. Two fragments of samian ware from the first century AD South Gaulish industry were identified; the base of a moulded bowl form Dr37 and a dish. Neither of them is particularly early and they probably date to the late 1st century Flavian period. About half the sherds are from Central Gaul and date from AD 120 onwards. Some of the sherds have been identified as Lezoux in origin. Some of these fragments (Dr42 and Dr18/31) attest to a Hadrianic occupation (AD 120-140). The rest of the Central Gaulish material is broadly datable to the second half of the second century. East Gaulish samian vessels comprise half of the total. Most of the forms present are late 2nd century/first half of the 3rd century in date (Dr31and Dr38). One of the examples of bowl Dr38 shows evidence of use for grinding (find number 28697). In addition to samian ware, a large proportion of the tableware is from the Nene Valley kilns. Beakers, bowls, dishes, jars, Castor boxes and lids are all represented. The beakers range from the rouletted types of the late second to early third century, the indented beakers of the third century through to ones probably dating to the late third to early fourth centuries. The bowls, dishes, jars and Castor boxes belong to the late repertoire of the late third to fourth centuries. Also present are four sherds of Oxfordshire red colour-coated ware flanged bowls, a ware appearing in late fourth century contexts at Lincoln (Darling 1977, 25). One pale fabric with brown paint compares with Nene Valley parchment wares but lacks chronologically sensitive features. Four sherds of oxidised and colour-coated ware are of Swanpool type. Sherds from a plain rim dish and bowl are in a colour-coated ware comparable to that made at Swanpool and an oxidised wide-mouthed jar is similar to one from the kilns there (Webster and Booth 1947 type C11), as is a small body sherd. The datable types span the period from initial occupation to the end of the fourth century, although mid- to late second century pottery is not well represented. It is possible that some less diagnostic sherds may fill this gap. The Nene Valley beakers and BB1 vessels include late second to third century types and the Oxfordshire red colour coated wares, late double lid-sated jars and the late shell-tempered wares all indicate activity in the late fourth century. The zone of high concentration of finds in field 9912 ends about 70 metres from the south western boundary of the field along the Fosse Way. A further 60 metres to the south west begins another zone within field 9809. It is about 50 metres wide and follows the Fosse Way to about 50 metres from the south-western field boundary. In this narrow zone are the bulk of the finds from this field. The group in this field is characterised by a large number of Nene Valley colour-coated ware sherds with the typically late bowls, dishes, a castor box, flagons and a fourth century slit indented beaker present. In addition there are sherds of a Nene Valley mortarium, Mancetter-Hartshill hammerhead mortaria, both reeded and painted, a Swanpool mortarium, a Swanpool bead and flange bowl, and grey wares including types belonging to the late third-fourth century such as bead and flange grey ware, plain and grooved-rim dishes, late, wide-mouthed jars and Dales Ware type jars. A small amount of the shell and grog-tempered wares typical of the 1st-mid 2nd century are present along with sherds of rusticated ware, Margidunum Parisian Ware and samian bowls and dishes. Two Dressel 20 amphora sherds were identified. A base of a moulded samian bowl form Dr37 from the South Gaulish industry was identified probably dated to the Flavian period. A single sherd from a dish represents the Trajanic Central Gaulish samian industry of les Martres de Veyre. The rest of the Central Gaulish material dates to AD 120 onwards with some sherds identified as Lezoux in origin. An example of a Central Gaulish samian form not produced until AD 170 is present- a Dr45 with remains of incised lines to represent the mane of the lion’s spout (find number 2764). Among the East Gaulish wares is a sherd probably from a spouted mortarium, a form dating to the late second-third century. Roofing material in the form of both ceramic and slate tiles and of two hypocaust tiles with their characteristic combed keying indicates the existence of a building of some pretensions in the vicinity. The date range centres in the late third to fourth century with a small amount of first-second century sherds. This date distribution may, however, only reflect the degree of plough damage, with the earlier material being protected by later, overlying layers and therefore not reaching the ploughsoil. The farmer in fact does not plough his fields, but for many years has used a cultivator, which works the top six inches of the soil only. A moderate density scatter of pottery sherds covers an area several hundred metres wide beyond the roundabout and the Fosse Way. It covers fields 9403, 9506, 9608, the southern parts of fields 9809 and 9912, 0007, 0111, most of 0414, 0412, the northern edge of 0209, 0409, 0306, 0710 and the northern half of 0507 (Figure 3.15). A thin scatter of finds occurs immediately adjacent to the Fosse Way as far as the railway bridge. The earliest wares are confined to the two fields closest to the end of the built-up stretch of road in 9809. In field 9506 these include an unusual grey ware rim sherd with grooves probably from a ring-necked flagon, a type made in the late 1st-early 2nd century. An everted rim sherd of “Trent valley ware” (GTA7) type (Todd 1968a) common at Margidunum in the mid-late 1st century and continuing into the first half of the 2nd century was also found. In the next field (9608) are body sherds of early, oxidised shell-tempered ware, fine grey ware and white ware, which are not closely datable. At the farthest end of this stretch, in field 9403 there are sherds of Derbyshire Ware, the handle of a white ware flagon (mid 1st-2nd) and a grey ware grooved-rim dish, a long-lived type in the 2nd to 4th century. The main area of spread, presumably a field system close to the town, covers fields 9809, the southern part of 9912, 0111, 0412, 0409 and 0507, with a sparse scatter in 0007, 0209 and 0710. Besides fields 9809 and 9912 the largest concentrations are in 0111 and 1412. Field 0111 yielded material that is diverse both in date and the range of wares and vessels represented. Early Roman ceramics include late 1st-early 2nd century reduced and oxidised ware jars and a carinated bowl. Tableware includes samian ware from Gaul, fine colour-coated beakers from the lower Nene Valle, and an oxidised ware beaker copying beakers imported from Germany and France and possibly made locally or at regional centres such as Doncaster, Derby or Leicester. The two, samian ware sherds are plain pieces from Central Gaul (AD120-200) and East Gaul (AD150-250). Specialist vessels for food preparation are represented by a Mancetter-Hartshill mortarium and a Dorset black burnished ware jar, the latter is a vessel particularly favoured by the Romans for cooking food such as stews, casseroles and soups and often found with the overspills burnt on around the rims. A Derbyshire Ware jar was identified and this was made at kilns operating in the Belper area from the mid-2nd century until the 4th century. These are rarely found with sooting and may have been storage vessels, perhaps initially sold for their contents. Jars in common grey ware are also present. The later vessels include medium sandy oxidised ware and Nene Valley beakers of the mid-late 2nd century and a fragment from a Castor box decorated with rouletting. This fine vessel dates to the 3rd century and is similar to a complete one (pictured below) already recovered from Margidunum and pictured elsewhere. No 3rd-4th century wares were recovered from this field. Two sherds from field 0208 mark the southward extension of the area of development represented by field 0111. One is a small fragment from a white ware flagon. Such flagons are most common from the mid first to the second century and rare thereafter. The high status traded wares and tableware indicate debris from domestic occupation of reasonable standing. The small amounts of samian, easily spotted when field walking, would point to civilian settlement since rather more samian and Dorset burnished black ware would be expected from a military area and the absence of ceramic building material or Roman concrete would indicate that the material came from a home of modest aspirations, though it is possible that the field walkers did not recognise the building material as Roman and may not have picked it up. Field 1412 yielded a similar amount of Romano-British pottery to the adjacent field 0111, but unlike 0111, there are more early wares including sherds of early shell-tempered wares. Other early Roman ceramics include a grey ware sherd, probably from a wide mouthed jar, and an oxidised everted rim jar, both of the late 1st-early 2nd century. Rather more Nene valley colour-coated ware was found including both mid-Roman beakers of the late 2nd-3rd century, another Castor box and the late Nene Valley range of bead and flange bowls and dishes dating to the late 3rd-4th century. A flange from a reeded hammerhead mortarium from kilns at Mancetter-Hartshill, near Coventry was present and dates to the 3rd-4th century. Only one sherd of second century Central Gaulish samian ware was present. It is a tiny scrap, some 11mm in diameter, which forms an almost perfect circle. The Romans liked to play games and counters fashioned out of broken pottery sherds, including samian, are not uncommon. This example is rather smaller than usual but its shape strongly suggests it was a broken sherd “re-cycled” in this way. Fields 0409 and 0507 are the southern extensions of this area of activity. In 0409 most of the datable sherds belonged to the second century. The diagnostic sherds include a grey ware flat-rim bowl or dish of second century date, a white ware sherd from a flagon of the mid-first to second century, a mortarium flange of early to mid second century date, a sherd from a grey ware carinated beaker most common in the second century, a black burnished type jar with acute lattice of second century type, a grey ware folded beaker of jar sherd dating to the late second to third century and a bead and flange bowl dating from cAD270 to the fourth century. This group includes some fine wares, such as sherds of a white flagon, a second century Central Gaulish samian sherd and a mortarium sherd from Mancetter-Hartshill, Lincoln or perhaps Margidunum itself. Most of the pottery, however, was utilitarian grey ware. The pottery from field 0507 is similar in range. It includes a sherd of a Mancetter-Hartshill reeded-rim mortarium of the mid-third to mid-fourth century, a grey ware with some grog (GTA10) large jar, probably originally lugged, of a type made at kilns along the Trent Valley such as those at Little London, Lea and Newton-on-Trent (Oswald 1937 and Field and Palmer-Brown 1991) in the second and third century, grey ware vessels including an everted-rim, narrow-necked jar, a long lived type with little typological development from the second to fourth century, and an everted-rim jar copying black burnished ware jars of the later second and early third century. A very small Nene Valley colour-coated beaker base is likely to belong to a pentice moulded beaker of fourth century type. Among the outlying occurrences are two diagnostic grey ware sherds from field 0007, which suggest a date after the late second century and probably in the third or fourth century. They comprise body sherds from jars, one probably a constricted necked jar with zones of burnished decoration, the other the shoulder of a wide-mouthed jar with acute lattice burnish. This last form of decoration suggests an earlier date but wide-mouthed jars of this type are rare before the late second century. A fragment from a Mancetter-Hartshill mortarium gives a date after AD 130/40. In field 0710 seven sherds were recovered. They comprise three in an oxidised sandy ware, a Nene Valley colour-coated base from a bowl or dish of late third to fourth century date, a sherd of Derbyshire ware, a grog-tempered sherd probably of mid to late first century and one very abraded scrap of grey ware. Lastly, far to the south of the main spread, in field 0306 a moderately abraded rim from a necked jar with everted rim tip was found. This form was most common in the second century after cAD120 and became less common after the mid-third century. A large number of bones of sheep/goats and pigs were found in the fields around Margidunum. It is not possible to say how old they are, but research reported by Todd (1969) and Carter (2003) showed that bones from these animals were found during the excavations of Margidunum. The Roman Army kept pigs as a ready source of meat. Four human bones were also recovered from the northern end of field 9912, close to the site of a Roman inhumation grave reported by Todd (1969). The presence of a thin scatter of Iron Age pottery in the fields around the roundabout seems to suggest that there was an Iron Age settlement hereabouts when the Romans arrived, which Todd (1969) estimates was between AD 50-55. The heavy concentration of Roman finds in the northern part of field 9912 and the presence of fine wares and building materials must reflect the proximity of buildings of some status either in the field or nearby. It is also likely that the concentration along the Fosse Way in field 9809, where building materials were also found, indicates the presence of buildings there. This conforms with the findings of Trent & Peak Archaeology. They found evidence of a building with clay floor and stone elements near Chapel Lane (Knight and Kinsley 1992) and to the north of field 9809 a laid limestone and sandstone spread was excavated probably part of a building (Knight and Kinsley 1992). The distribution of undiagnostic ceramic building material recovered by them along the Fosse also coincides with this zone. Although as yet unpublished, an excavation done by Wessex/Cotswolds Archaeology in 2009 in field 9912, 130 metres north east of Buggins cottage, revealed a fine Roman stone-lined well in addition to other evidence of buildings. The full extent of the built zone is possibly concealed by alluvium. This is certainly true at the north end of field 9912 and in 0414 where some of the first century material has been protected by superficial deposits. Deposits thought to be alluvium, or possibly colluvium, have been found to overlap Roman features near Fosse Road Farm (Knight and Malone 1993). Pottery from the underlying layers is of early date – first-second century. It is thought that this side of the road may have been damp and marshy suffering from intermittent flooding. Whether this conceals a continuation of the south-western extension of the built-up zone to Fosse Road Farm is uncertain. The shape of the high-density zones suggests that the built-up area was confined to the defended town centre and along each side of the road. According to Hanley (2000) this conforms to the pattern seen in small Romano-British towns that have grown organically, rather than ones that have been planned. No evidence was found in our finds that indicated a military presence, but Todd (1969) believes that there was a garrison here from AD 50-55 to around AD73. The significance of the spreads in the outer areas is less easy to determine. With respect to quality and age, the range of finds reflects that in the built-up area and it may be that these scatters are entirely the result of the spread of manure in a field system backing the development along the Fosse Way. There are hints of small clusters in fields 0414 and 9912, away from the road, and elsewhere that might suggest the presence of small cottages among the fields. Leary and Baker (2004) suggest that although there would have been buildings of various kinds along the Fosse Way, probably set within ditched or fenced compounds, the boundary between urban and hinterland is usually blurred around small towns. The development of Margidunum over time can be seen in a plot of the datable sherds (Figure 3.16). This shows that the highest concentrations of mid 1st to early 2nd centuries finds are confined to fields 9912 and 0414. Expansion of the built-up area south westwards along the Fosse Way beyond the northern part of field 9912 appears to have started in the second century quickly reaching to within 70 metres of the south western boundary of field 9809, where development appears to have stopped. The field system providing support for the town was extensive in the 1st century, covering fields 9506, 9608, 9809, 9912, 0111, 0412 and the northern end of 0409. This is a fairly compact, regular shaped area. It expanded through the 2nd century reaching its maximum extent then, but there is a suggestion of small outlying fields being developed in fields 9403, 0306 and 0710. This is supported by a sparse scatter of Roman potsherds recorded by Knight and Malone (1993) in the fields to the south west of 9809 along the Fosse Way (9403, 9506 and 9608). The plot for the late 3rd to 4th centuries seems to indicate a reduction in the area under cultivation and reduced activity in the remaining fields, thought the undated grey wares may be filling the missing time units. Only in field 9809 is there any late expansion, where sherds of late 3rd – 4th century age are dominant in the southern half. Figure 3.16. Four maps each showing the distribution of pottery around Margidunum for a particular age. Late 4th century finds are confined to the high-density, built-up area near the town centre in field 9912. There are none in what might have been the areas of cultivation near the town, nor in the built-up zone along the Fosse Way in field 9809. The relatively large amount of table ware, in the form of bowls, dishes, cups and beakers in the assemblages for fields 9809 and 9912 support the high status suggested by the amount of samian, amphora, colour-coated wares and durable building materials. 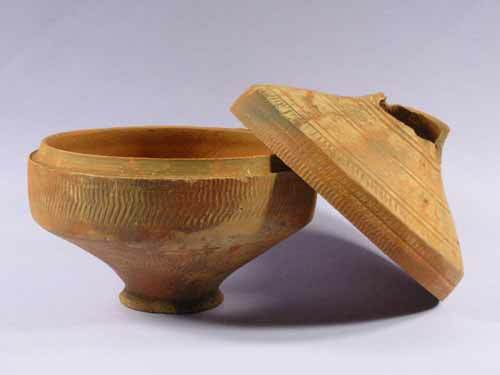 These indicate households that had adopted Roman eating and drinking habits and were able to acquire the required tableware and foodstuff, such as olive oil and wine. Collector bias, however, may have exaggerated this. In this project we have only looked at the small segment of Margidunum that lies within the parish of Bingham. Trent & Peak Archaeology, however, have field walked extensively outside the parish, but have confined their activity to areas close to the Fosse Way and the A6097 (Knight & Kinsley, 1992, Kinsley, 1993, Kinsley et al. 2005). Thus, although the zone of high-density finds is reasonably well defined for all parts of the town it is only in Bingham parish that the full extent of the area of activity behind the town centre has been explored (Figure 3.17). Nonetheless, it is apparent that the main urban development lies to the north of the defended town centre and that on the south it is limited to ribbon development on both sides of the Fosse Way. It is possible that here, development on the west of the Fosse Way was limited by the presence of a villa some 580 metes west of the town centre. On the east of the Fosse Way it is likely that the potentially boggy areas over the lake deposit limited expansion. Figure 3.17. The distribution of finds around Margidunum collected over several years by Trent & Peak Archaeology and BHTA. The area of high density of material defines the minimum area of the town. The boundaries in the north, on either side of the Fosse Way define the limits of survey. The 1883 OS topography is shown as a base because it gives a clear image of the central defended area of the town. Leary and Baker (2004) have summarised all the sources of information available for the area and made comparisons between Margidunum and other small towns in the region. They suggest that there may have been an early fort to the north of the defended town centre and that this part of the town would have been an urban sprawl of buildings, ditched enclosures and lanes, developed and redeveloped over the 350 years of occupation. A double-ditched enclosure between Starnhill Farm and the River Smite is clearly visible on air photographs. In Figure 3.19 an image of the original air photograph has been rotated to the vertical and overlain on the 1883 topographical map. It is situated on a slightly raised area close to the River Smite. The outer ditch is rectangular with a curved eastern boundary. It measures about 105 metres by at least 80 metres. The inner enclosure appears to be square and measures about 80metres, but the southern boundary ditches to both are both concealed under alluvium making exact measurement impossible. There is the suggestion of other features nearby on the air photograph, but nothing to indicate where the buildings were. Coleman (1979) found Roman grey ware, Dales ware and samian ware at this site. Because of its importance this part of field 2383 was walked at 10 metre-spaced transects. It yielded 55 sherds of Roman and a single sherd of Iron Age pottery in a linear distribution parallel to and overlapping with the western boundary ditch (Figures 3.12 and 3.19). Three fragments of brick, a fragment of fired clay, three or four fragments of stone and four fragments of a hard substance, perhaps concrete, were collected. The possible building material may be significant, though none of the ceramic building material was diagnostic of the Roman period. The fragments do raise the possibility of a Romanised building in the vicinity. Four other pottery sherds were recovered from this field some distance from the double-ditched enclosure. The majority of the finds in this cluster are undiagnostic grey ware, but there are some that can be dated. There are no 1st century fabrics, but there are several from the second century including Derbyshire ware, a gritty grey/black ware sherd with traces of rouletting that appears to have been worked into a roundel, white ware from Mancetter-Hartshill and a fragment of samian ware. This was identified as an import from Lezoux in Central Gaul during the Hadrianic occupation (DR18/31). There are few late 2nd –3rd century finds, among which are Nene Valley colour-coated ware and grey ware, but there are many from the late 3rd-4th century. This material, where closely datable, comprises grey ware forms typical of this period (Todd 1968b) such as narrow-necked jars with outcurving rims, wide-mouthed jars with heavy burnished, bead rims and inturned flanged bowls with frilled rims of a type found at the Swanpool kilns at Lincoln in the late 3rd century (Webster and Booth 1947 type D14-18, Darling 1977, 27). The fine wares include similarly dated vessels: a Nene Valley colour-coated lid of fourth century date (Perrin 1999 nos 214-5) and part of a bowl or dish of the late third to fourth century repertoire of table wares, a Swanpool colour-coated beaker fragment also of this date and an oxidised bowl copying samian form 38, probably from the late Swanpool kilns. A small, unworn fragment from an Oxfordshire cream mortarium is significant. The site lies on the edge of the distribution zone of Oxfordshire wares and fine wares at least were not reaching Lincoln until the mid- to late fourth century so a late date may be suggested (Darling 1977, 25). Undiagnostic Lower Nene Valley mortarium sherds were present. 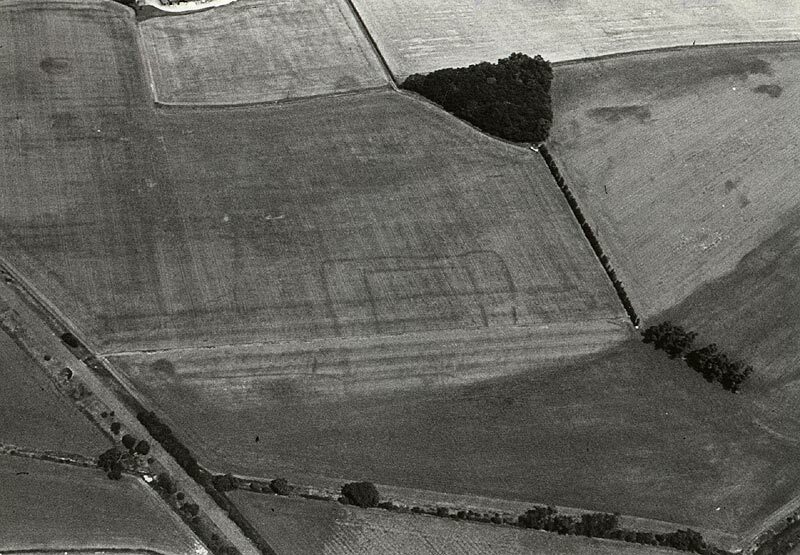 Double-ditched enclosures elsewhere in Britain are attributed to the Iron Age and Riley (1980) has recorded their occurrence in Yorkshire and Nottinghamshire. In Garton’s (2008) study of the area around Dunston’s Clump similar double-ditched enclosures were recorded associated with Romano-British pottery clusters and like this one at Starnhill, they tended to be outside and along one side on the enclosure. Only a single sherd of Iron Age pottery was found here, with no first century Roman pottery and only a small amount of dated 2nd –3rd century wares. There is, however a good deal of undated grey ware here and some of it may well be early. Overall, though, the pottery assemblage is mostly made up of simple domestic wares and the ware types give best evidence of occupation in the late third probably until the mid-fourth century. A single sherd of Oxfordshire ware is the only indication of late 4th century activity. The general absence of typical later ware types, such as double lid-seated jars and South Midlands shelly ware suggests there may have been, if not a cessation, a diminution of economic activity after the mid-fourth century. The evidence of the undiagnostic ceramic building material is tantalising in its suggestion of Romanised buildings. Further evidence is needed before this can be firmly identified as belonging to the Roman period although its association with a cluster of late Roman pottery is highly suggestive. More work is clearly needed at this site to establish whether or not this double ditched enclosure originated in the Iron Age or belongs to a later date. It is interesting to contrast the assemblage in this field with that in field 9912, which is adjacent to the Margidunum town centre. 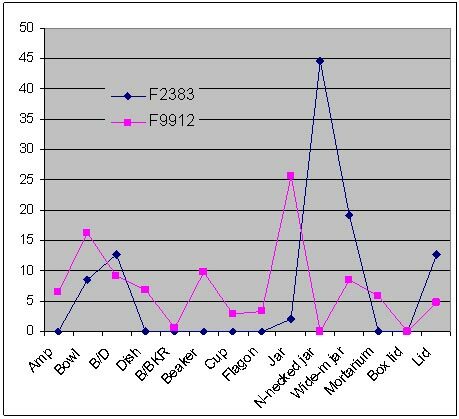 The proportion of fine wares (15% colour coated ware, 5% samian ware and 1% Swanpool fine ware) and imported goods (1.5% amphora) from field 9912 illustrate the level of table wares obtained at the small town/urban setting in contrast to field 2383 where colour coated wares amount to 3.4%, samian 1.7% and Swanpool fine ware 1.7% with no amphora or black burnished ware (BB1) sherds. The different status of the double-ditched enclosure beside Margidunum is also illustrated by the proportions of different vessel types from field 9912 (Figure 3.20). 9912 having more fine tableware such as cups, beakers, flagons, bowls, dishes and amphora while 2383 has more jars. Figure 3.21. An air photographs taken looking westwards near Starnhill Farm. It shows a square enclosure with the suggestion of a double ditch along the north eastern boundary. On another view there is part of a second rectilinear enclosure to the north east of this one. Few Roman pottery sherds were found here, but it is thought that this enclosure might have been part of a set of fields used by the occupants of the nearby double ditched enclosure. ©English Heritage. NMR (Jim Pickering Collection). Immediately to the east of the Starnhill Plantation there are crop marks that suggest a small field (Figure 3.12). In Figure 3.22 the air photograph has been rotated to make it appear as a vertical photograph and the locations of the Roman pottery finds are shown on it. The relationship of this field to the double enclosure is not clear, but the two finds collected at the edge of this enclosure are undiagnostic grey ware and a second century white ware. Two finds from near the River Smite, south east of the double-ditched enclosure are grey ware, one of which is a fabric common to the Nene Valley in the late 2nd to 3rd centuries. The other is a late 3rd to 4th century fabric. All of these fall within the range found in the double-ditched enclosure and suggest that they might have been deposited in fields farmed by the occupants of the enclosure. Figure 3.22. The air photograph in Figure 3.21 rotated to the horizontal and re-orientated to fit the topographic map and showing Roman pottery finds collected near the crop marks. There is an elongate spread of Roman pottery sherds from the north-eastern part of field 2383, north-north-westwards to the A52 (Figure 3.12 and Figure 3.23). Unlike the cluster around the double-ditched enclosure there is 1st century pottery here and a number of Iron Age sherds were found. The assemblage in field 2383 and 2586 is separated and slightly offset from the main assemblage to the north north west. Though it is not known if this is significant the two areas are treated separately here. Figure 3.23. The area around the junction of Granby Lane and the A52 showing the distribution of Roman pottery by age on both sides of the lane. Near the northern boundary of field 2383 there are three sherds only. They are early grog-tempered ware (GT) and an undiagnosed grey ware (GRB1). Field 2586 lies just to the north of field 2383 and like it yielded a scrap of early grog/shell tempered ware. It also yielded sherds from several Nene Valley colour-coated ware vessels of late third-fourth century type – two plain-rim dishes, a bead and flange bowl and a beaker. One fragment of tile, typically Roman, was in a cube shape, 30 x 25 x 24mm. Whether this was deliberate working or accidental is uncertain. A sherd from a samian bowl or dish came from East Gaul (DR31R) and dates from the late 2nd –early 3rd century. There is a linear cluster of sherds extending over fields 2491, the eastern corner of 2388 and the eastern end of 2093 (Figure 3.12 and 3.23). Several finds were also collected east of Granby Lane in field 2890 including a small group near the western field boundary with Granby Lane. A group of 23 sherds in Field 2491 spans the first to fourth centuries. Scraps of grog-tempered wares date from the 1st-mid 2nd century as does an everted fine grey ware rim, which may have come from a carinated beaker/bowl. Three, second century sherds are grey ware and white wares, one possibly from a mortarium. The majority of the finds fell into the late 2nd to 4th century range. One of the two earlier ones is a samian rim sherd from a vessel imported from East Gaul (DR38) in the late 2nd to mid 3rd century. Among the others are three Nene Valley colour coated sherds from a plain rim dish or bowl, a Castor box and a beaker of unknown form. The bowl or dish and the box belong to the late range of the Nene Valley potters. A sherd from a Nene Valley reeded-rim mortarium also dated to this period (Perrin 1999 type M42) and an oxidised sherd from a bead and flange bowl or a flanged hemi-spherical bowl is likely to come from the late Swanpool kilns at Lincoln. A Mancetter-Hartshill mortarium with reeded hammerhead rim was also identified and belongs to the mid-third to mid-fourth century. The north eastern corner of Field 2388 produced a small group that includes early shell-tempered and grog-tempered material of the first -mid second century, undiagnostic grey ware sherds, two samian fragments and two Nene Valley colour-coated sherds, from a beaker and an open vessel. This last vessel may belong to the third and fourth century but the other sherds indicate an earlier emphasis in the mid first to mid second century. The samian sherds are both from Lezoux in Central Gaul and date from the 2nd century. One of them (DR37) is a fragment of a mould-decorated form. Two of the sherds are from the western side of the field, way outside the cluster. In the group from this field the vessel types quantified by EVES are all bowls, but the body sherds include jars and a Nene Valley colour-coated beaker. Two sherds were found in field 2093, both colour-coated wares. One was from the Nene Valley industry, a scrap of beaker, while the fabric of the other suggested it came from the late third-fourth century kilns at Swanpool, Lincoln and came from a plain-rim dish. Most of the sherds found in field 2890 are grey ware and not closely dated, but there is one sherd of grog-tempered ware dating from the mid 1st to early 2nd century, a body sherd from a 2nd century carinated bowl and a rim sherd of 3rd-4th century grey ware. No building materials thought to be Roman were collected in these fields and no crop marks have been photographed. West of Granby Lane the spread is linear and over 600 metres long and it may be significant that most of the third to fourth century sherds concentrate in the north western part of the field while the first to second century finds are from the south eastern part. Finds from the period in between lie between and overlap these spreads. This may suggest some sort of migration of activity northwards with time. However, many of the sherds in these fields are scraps and not easy to interpret. Whether there was a settlement in field 2491 or nearby is not yet known and continuity of occupation/activity cannot be firmly demonstrated. The scatter in field 2388 is very dispersed and may not represent domestic occupation. It is also difficult to interpret the finds in field 2890. The group of five near the lane may indicate a household midden, but the rest are widely dispersed. The largest cluster of Iron Age pottery away from Parson’s Hill was found in field 2491 and the Iron Age pottery is interspersed with the Roman sherds. On the eastern side of Granby Lane in field 2890 the small group of Roman pottery has only one Iron Age sherd anywhere near it, while the cluster of five Iron Age sherds in the far east of the field alongside the A52 has only one Roman sherd with it. Whether or not there was continuity of occupation from the Iron Age through the Roman period cannot be demonstrated with the evidence at hand, but the nature of the assemblage here does favour this as being an area of occupation for some if not all of the time from the Iron Age through to the 4th century. Except for the presence of the first and early second century material in this group of fields the mix of fine wares and domestic wares is similar to that around the double enclosure, which suggests a similar life-style for the people here. There is a similar lack here of any late fourth century forms. Apart from the Granby Lane and double-ditched enclosure sites the only other significant concentration of Roman finds in the south eastern part of the parish is in field 1289. This group of six sherds includes a second century Derbyshire ware body sherd and a grey ware sherd from a burnished jar with intersecting loops, a type found in the later Roman period c. late 3rd-4th. . Sherds of shell-tempered ware, grey ware and medium oxidised ware are not readily datable. A basal sherd of a Nene Valley colour-coated bowl of the late 3rd-4th was found in the northern part of the field away from the main group. This is a small concentration, similar in size though not in date to the Lower Brackendale one, but there is no other evidence that it may be associated with a small homestead. Crop marks on Parson’s Hill have long been thought to indicate an Iron Age settlement (Figure 3.11). However, while Iron Age pottery has been found associated with the crop marks in the western part of the set of enclosures, only Roman pottery has been found in the east. Most of the Roman sherds found are undiagnostic grey ware, but there is one piece of brick of possible Roman origin, a fragment of grog-tempered ware characteristic of the 1st to early 2nd century and a fragment of a Swanpool mortarium characteristically late 3rd to 4th century. It is possible that an original Iron Age settlement on the western site migrated eastwards after Roman settlement in the area, but little more can be said. The wide spread of only five sherds of Roman pottery does not provide convincing evidence of long-term occupation here despite its long time range. Air photographs show two adjacent enclosures in this field with a circular structure in the middle of the larger of the two on the east. This one, which is roughly rectangular, measures around 50 metres long. Its width is less, but cannot be measured because the southern boundary is concealed by alluvium. The enclosure to the west is about 38 metres long and irregular in shape. It southern boundary is also concealed beneath alluvium. 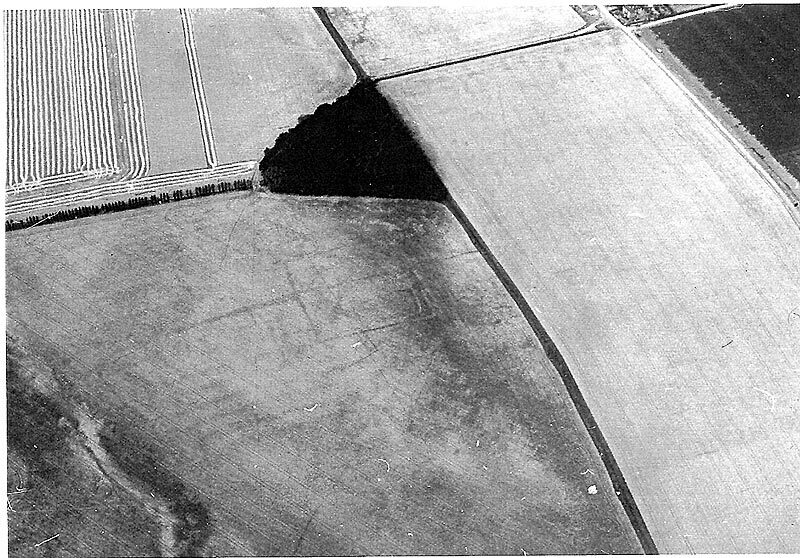 Crop marks to the north of these enclosures are more regular and mirror the outline of the present field boundary. They may not be of any antiquity, but there is no field of this size and shape in this location on any of the maps from 1776 to the present. The five sherds found in this field (9274) are quite abraded. Two are grey ware and another is a medium oxidised sandy oxidised ware, all of indeterminate age. Two others are white ware, one part of a flagon neck of mid 1st-2nd century, possibly from Mancetter-Harshill. The single sherd found in the field 9375, immediately to the east and part of this cluster is also an indeterminate grey ware. To what extent this assemblage indicates an Iron Age homestead that continued through to the second century and became abandoned cannot be determined from this evidence alone. This small cluster is about 500 metres from the Lower Brackendale enclosures site and coincides with a cluster of Iron Age pottery sherds. Like it there are few finds and they are not well preserved, but they include sherds of shell-tempered and grog-tempered wares from the 1st to early 2nd centuries, a late 2nd to 3rd century Nene Valley colour-coated ware and an indeterminate grey ware sherd. The age range spans that of the nearby Lower Brackendale enclosures site extending into the 3rd century. Compared with the more elaborate, double-ditched enclosure on Starnhill Farm both this and the Lower Brackendale enclosures site have a very poor assemblage. There is little outside the two clusters. Two finds in the south-eastern corner of field 8982 may be associated with Roman fields belonging to either of these cluster sites. They give dates in the late 2nd to 3rd and late 3rd to 4th centuries. If this is a homestead site it seems it might have belonged to a poor family, which for several generations was little involved with the Roman way of life. The age range of the sherds suggests, however, that there was activity of some sort in this area from the Iron Age to the middle of the 4th century. Seven sherds form a cluster in the south-eastern corner of the field. All are small and very abraded. Five of them are indeterminate grey ware, one of which is a rebated rim not definitely of Roman origin. Two are colour-coated scraps, one of which is a Nene Valley product, which reached into this area in the late 2nd century. The significance of this cluster is not clear. Isolated sherds attributable to the 1st and 2nd century have been found in adjacent fields and there is a single sherd of Iron Age pottery, but there is no other evidence of activity from this period hereabouts. Three finds on the northern boundary of this field and one just to the north of them in field 9985 form the least distinctive cluster. It is around 450 metres north north west of the cluster in field 0179. The three sherds in field 0082 gave a range of dates. A white ware base, probably from a flagon, is a type most common in the mid 1st-2nd century and a sherd from a Nene Valley colour-coated beaker, is a type traded from around the mid/late 2nd century onwards. The oxidised sherd was undiagnostic and may not be Roman in date. The grey ware sherd in field 9985 is undiagnostic. Two other sherds were collected from these two fields. One is an early, oxidised shell-tempered ware scrap likely to date to the early Roman period, mid 1st -early 2nd century. The other is a possible colour-coated sherd, which may be Roman and of late date, 3rd-4th century. There is no other evidence of any activity in these two fields. All except two of the sherds in this field concentrate in a group. They include sherds from a grey ware (GTA10) large jar, probably originally lugged, a grey ware (GRB1) everted-rim jar of second and third century type, a multi-reeded Mancetter-Hartshill mortarium of the mid-third to mid-fourth century and a very abraded Nene Valley colour-coated sherd with rouletting, which probably came from Castor box of third to fourth century date. One scrap from a white ware flagon was also present. None could be dated with certainty to before the 2nd-3rd century. The significance of the group is not known. Taking black burnished ware and samian ware as indicative of access to the trading network based around the military occupation and urban development of Margidunum their distribution is revealing. Black burnished ware was found only in the three fields immediately adjacent to the town centre (9912, 0414 and northern end of 0111). Samian ware is more widely dispersed. It is present in the town centre and roadside development areas of Margidunum (9912, 0414, 9809) and in the infield area behind the built-up zone (0111, 0412 and 0409). It is also present in the double-ditched enclosure on Starnhill and in the Granby Lane Junction assemblage, while two sherds were collected in isolated areas in the south of the parish, though not associated with any of the small clusters. Grey ware is the main utilitarian ware type. Overall it makes up 45% of the total number of finds (by number) and 49% of the total RB material collected from the Margidunum fields. It makes up 76% of the finds from the Starnhill double-ditched enclosure, which might seem reasonable for a small rural homestead, but only 23% of the total RB finds in the Granby Lane Junction assemblage. Even adding the early grog- and shell-tempered wares to this total brings the proportion of utilitarian wares to 40%. This is an unusual assemblage that should be further investigated. Todd (1968a) has argued for a local source for the grog-tempered wares, while early grey and oxidised wares are likely to have been produced nearby in the first and possibly the early second century. The source of the common grey wares in the later second to fourth centuries is likely also to be relatively close. Kilns are known in the Trent Valley at Lea, Newton-on-Trent (Oswald, 1937 and Field & Palmer-Brown, 1991) in the second and third century, Little London and Knaith (both in Lincolnshire) although the rather coarse grey wares from Lea and Newton-on-Trent have not been found in any numbers at Bingham. Other kilns are likely to lie undiscovered and a programme of chemical analysis would elucidate the sources of these wares. The shell-tempered wares are very likely to have been made within a short distance of Margidunum. A small amount of grey ware (3% in field 9912, rather less elsewhere) was obtained from the Nene Valley kilns. In the area immediately around Margidunum between 14-20% of the assemblage from fields 0111 and 0412 and at least 25% of the assemblage from field 9809 came from the Nene Valley kilns. Away from Margidunum the proportion of Nene Valley wares is lower, around 7%. Only a small proportion of wares came from the kilns at Swanpool, Lincoln and Oxfordshire. Kay Hartley (pers comm.) has raised the possibility of local mortaria production at Margidunum and some of the white ware mortaria of the late first-early second century are difficult to attribute to a kiln and may be from a local source near Margidunum, a kiln at Lincoln or belong to the rather variable early mortaria group from Mancetter-Hartshill, near Coventry. Most of the mortaria, however, were obtained from the Mancetter-Hartshill kilns, near Coventry, probably accompanied by the white ware flagons. Others, including a flagon in field 9809, came from Verulamium, modern St Albans. Mortaria were also obtained from Swanpool, Lincoln, the Nene Valley industry and Oxfordshire. Small amounts of British traded wares include black burnished ware from Dorset and, to a lesser extent from Doncaster, and the Belper area (Derbyshire ware). Pottery from more distant sources is represented by Spanish Dressel 20 oil amphora, mostly around Margidunum, and by the Gaulish tablewares found in many parts of the parish. These samian wares originate in South, East and Central Gaul, with the Lezoux area being prominent among the Central Gaul wares. A single sherd was found that came from Martre de Veyre in Central Gaul. At the time the Romans arrived, Bingham and the surrounding parishes were already a well settled and probably an intensively farmed area. Several Iron Age farms or small settlements were functioning within the area of the Bingham parish and it is likely that the site that the Romans chose to build Margidunum was already a British settlement. The impact that the Romans made on the economy was considerable. The construction of the Fosse Way, the building of Margidunum, the villas at Newton and Car Colston and the Carnarvon farmstead or villa were significant additions to the economy of the area and the impact of these on the rural hinterland probably led to changes in farming practices. At Margidunum, Lower Brackendale, Parson’s Hill and Granby Lane the Roman pottery clusters occur in close proximity to Iron Age pottery clusters and although continuity of occupation at these sites cannot be proved it looks likely that the British Iron Age inhabitants continued to live here and adopted Roman eating habits after a while. On Parson’s Hill there is evidence that an existing Iron Age settlement may have been rebuilt to the east after AD50-55. 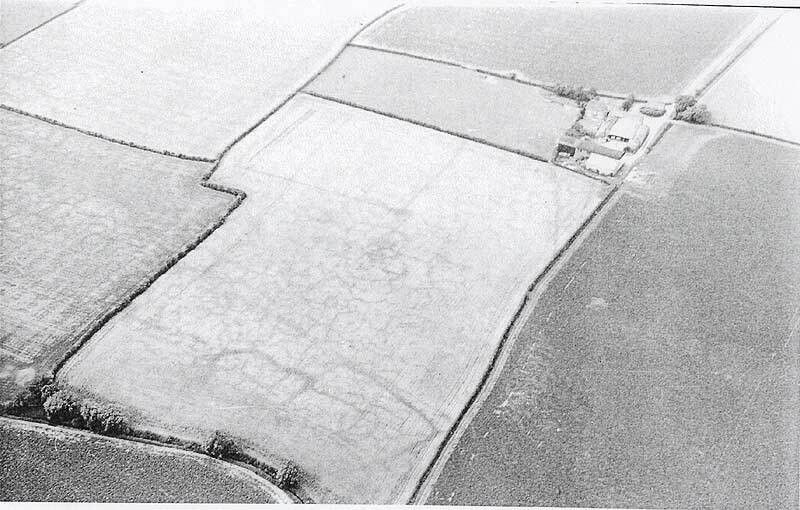 The most difficult site to interpret is the double-ditched enclosure on Starnhill Farm. While this sort of enclosure is recorded as Iron Age in other parts of the country, there are similar types of enclosure in northern Nottinghamshire, which are clearly Roman. At Starnhill only one sherd of Iron Age pottery was collected and there is only a small amount of evidence of a Romano-British presence here before the 3rd century, when it is substantial. Of all the rural sites this is the only one with ceramic building materials that might be Roman and indicative of a shift away from the typical British roundhouse to a Romanised rectangular house. Evidence from field walking along the A46 and the A6097 shows that Margidunum was a substantial small town. The main urban development was to the north, outside Bingham parish. Within the parish the southwards urban expansion seems to have been limited to ribbon development along the Fosse Way for about 800 metres from the defended town centre. However, the spread of Roman pottery in the area behind the roadside built-up zone extends for around 700 metres. This is most likely to be the result of manuring in a field system used for growing crops in support of the urban population. It cannot be ruled out that there might have been small cottages among these fields. The hinterland to Margidunum contains a wide, thin spread of pottery sherds and a number of small clusters. Some of the clusters are associated with crop marks indicative of settlement or small farms, but most are not. However, by analogy with other areas of Nottinghamshire and the south Midlands it is reasonable to assume that many of them probably do mark the sites of small farms. Whether or not the Romano-British farmer spread farmyard manure containing domestic waste on his fields is open to debate, but it is difficult to interpret the thin spread of Roman pottery across the parish in any other way. As a working hypothesis it is suggested that under the influence of the Romans the indigenous Iron Age British living in the hinterland to Margidunum changed their farming practices from predominantly stock rearing to largely arable and brought large areas of the parish that had been either woodland or pasture under cultivation. The increased labour force required for this change is reflected in the establishment of several new farmsteads for which there is no evidence of prior Iron Age occupancy. Where this labour came from is an interesting question, because it is clear that for Margidunum to expand to the size it did a certain amount of immigration either from the surrounding countryside or farther afield was also required. The indications, then, are that new people had to come into the area both to grow Margidunum and to work the arable fields. Perhaps this is a matter that further research may be able to address. The proportions and types pottery wares found in and near Margidunum contrast with those found at the double-ditched enclosure in a way that reflects the differences between urban and rural living. At Granby Lane, however, the only other big group of pottery sherds in the parish, the assemblage is unusual and needs further investigation. The date range of the pottery found both in the ribbon development along the Fosse Way and in the fields behind it reflects Todd’s assertion that the Romans settled the area in the mid 1st century. It also indicates that the main period of growth was in the second century. Although pottery from the late 3rd to early 4th century is the most widespread in the parish, there is a hint that at this time the area under cultivation near Margidunum diminished in size. Late 4th century pottery is rare, with all finds except a single sherd of Oxfordshire Ware found at the double-ditched enclosure, being found in fields very close to the defended town centre of Margidunum. The presence of 5th-8th century Anglo-Saxon wares sherds around Margidunum, the Lower Brackendale sites (9 and 10), Granby Lane and the Starnhill double-ditched enclosure seems to imply that though there are no late 4th or 5th century Roman pottery finds from two of these areas either that life did carry on there until the arrival of the Anglo-Saxons or they were reoccupied by the Anglo-Saxons.